Urban survival is a tricky subject to discuss. There are advantages to urban survival. 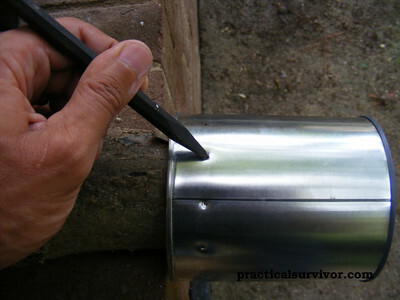 Anywhere you look there are items in trash cans and dumpsters that can be used to improve a survival situation. Cardboard boxes can be used for shelter, newspapers can be used for insulation and to the practical survivor another persons trash can be a treasure. 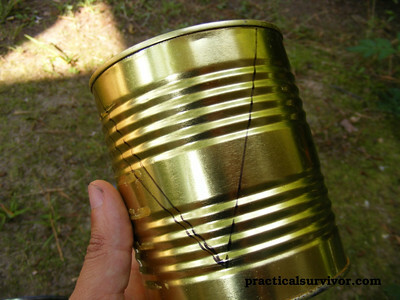 In this case we will use a coffee can to build a stove. 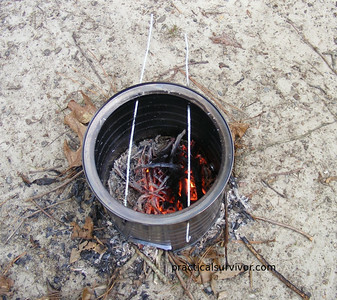 Whether you call it a hobo stove, can stove, or just a survival stove, this is a cheap effective way to both cook and stay warm. Keep an open mind during any survival situation. 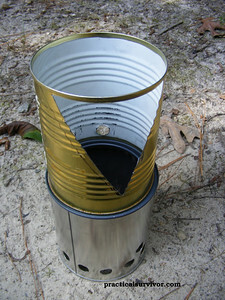 This stove can be used during a black out (power outage) caused by hurricanes to boil water and help purify it. Sadly, we recently watched victims of hurricane Katrina succumb to thirst. Preparation and knowledge or urban survival techniques, could have helped some to make it through that disaster. Methods of water distillation and purification options can take minutes to learn and could save you and your loved ones. 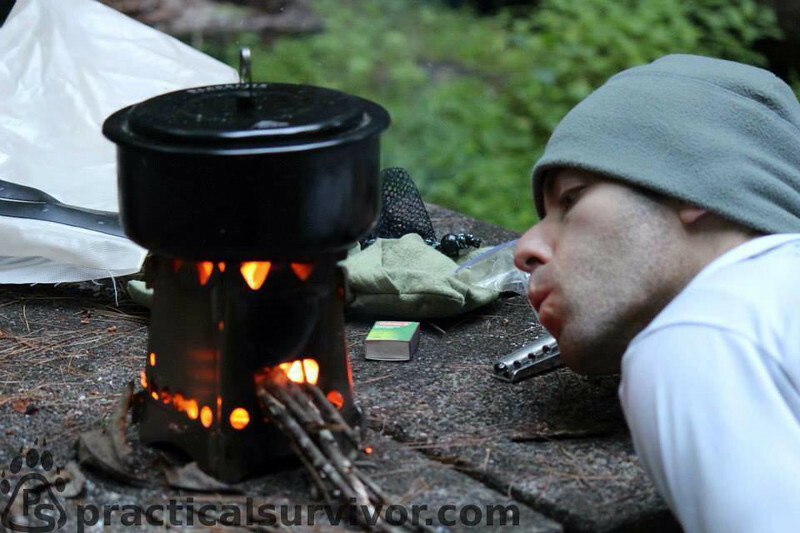 Whether backpacking, camping, or surviving, having a way to cook can make a huge difference. Whether that is a nice warm meal or life or death, knowing different methods of cooking is crucial. 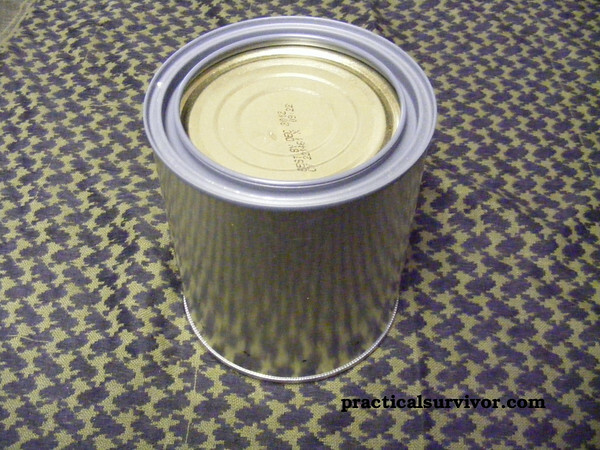 A coffee can or large vegetable/ravioli can will allow you to build a stove and cook. A smaller can such as pork and beans can be used as a pot. 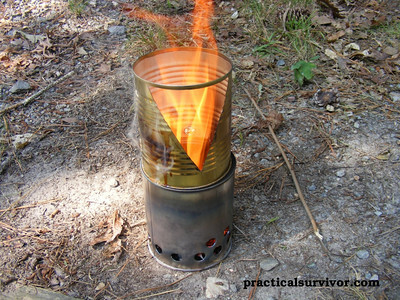 There are many methods that could be used to build this stove. 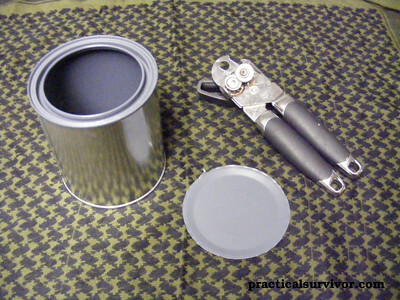 Instead of tin snips a chisel or a flat screwdriver could be used to cut into the can. We use a metal coat hanger to build rods which will help hold up the cooking pot. The top side of a coffee can is already opened. If the bottom is left on, we would not need the can opener for this project. Just make sure to drill extra holes in the bottom area of the can so the tinder gets proper ventilation. We then used the tin snips to cut a small door. This opening will be used to feed the fuel for the fire. We tried to use a can piercer (triangle can opener) to make the holes instead of a drill. In an attempt to save money companies are using thinner cans and this is what happened. This could possible be avoided by leaving the bottom side of the can untouched. The added rigidity should allow the use of a sharp triangle can opener to make the ventilation holes. 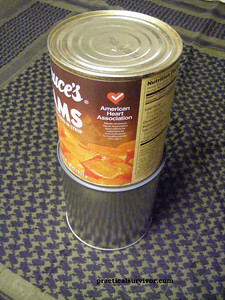 For this project we used a drill with a 1/2 inch drill bit to make the larger holes at the bottom of the can. If a drill is not available, the can needs to be supported by a piece of wood and a screwdriver or knife can be used to punch holes into the can. Four more holes need to be drilled along the top side. The holes will allow us to push the wire pieces we built using the coat hanger. Use wire cutters, a multi-tool, or just bend the hanger back and forth until it breaks. Now you can see how the two wires will hold up our cooking pot or smaller can. This is just another way to adapt to the situation. 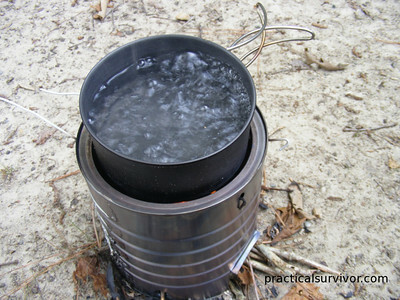 Water can be boiled in a beer can or empty food can. The wires hold up the small backpacking pot perfectly. Next we started a small fire using leaves and twigs. Normally we would allow enough time to build a bed of coals. 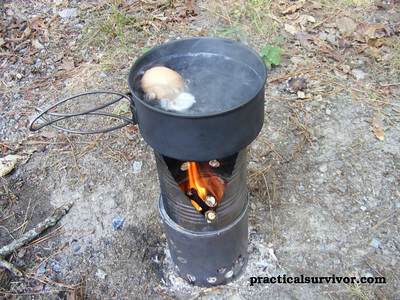 Here we started attempting to boil the water as soon as we started the fire. We wanted to time the process. We placed the pot on top of the stove and within minutes we started to see steam. We would want to wait until the water comes to a roaring boil. We added small twigs and sticks through the square hole we cut into the can using the tin snips. A little over six minutes and we had boiling water. The temperature on this day was eighty degrees Fahrenheit. During cold conditions we would want to allow the coals to build up and a longer time to boil. 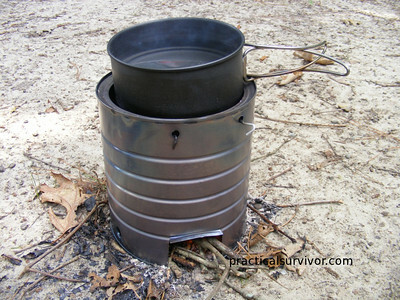 There are many different designs floating around on the internet for coffee can stoves or hobo stoves as some call it. While some designs might be more efficient that others, the amount of tooling and work needed to make the stove should be taken into consideration (if we want to be practical). Note: The grinder could be replaced by using a screwdriver and tin snips. 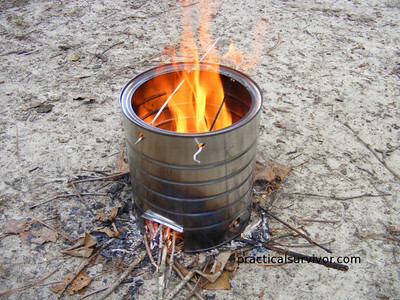 The total cost for this stove was four dollars and we were able to eat the food in the can. The paint cans can be purchased empty at most hardware stores. We did experiment with different size paint and food cans. The important point is that the top can fits in the lip of the paint can. We test the food can for fit on the lip of the paint can. For this particular paint can we used a 29 ounce can of sweet potatoes. Using the can opener, we remove the ends on the food can and the bottom end of the paint can. The top can if properly selected will also fit inside of the paint can. Next we use the tape measure to mark holes at an even distance. We chose one hole per every inch. Using a hole punch, we set the point where we will drill the holes. 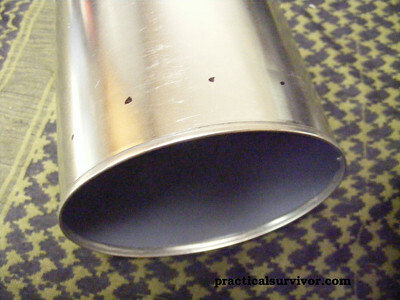 Its important to find something to support the can while punching and drilling. We used a round piece of a branch. Once the holes have been drilled, we want to use a file to make sure we clean up the inside of the can. 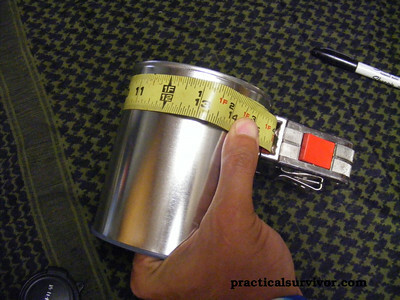 This could prevent us from getting cuts and allows the top can to fit inside of the paint can. We mark a "V" shape on the top can. This open area will be where we feed the tinder and fuel to the stove. We use the grinder to cut the proper shape. The final product should look something like the picture above. We are purposely leaving the specifics on measurement, drill bit size and amount of holes so that people will experiment. All the survival gadgets in the world will not help you, if you are unwilling to expand your mind. Learn to use what is around you. Search on the net for different designs. Now to test the stove. One of the many conveniences of a hobo stove is the option to use very small fuel. Small twigs and leaves are all that is needed to keep a fire going. The smoke and light from the is minimal. There is no need to cut down branches to feed a fire. 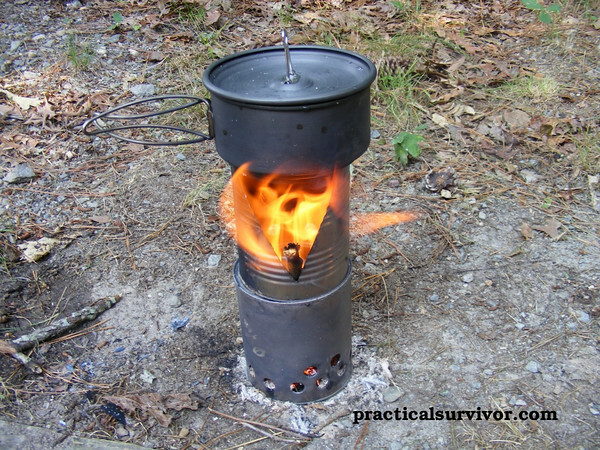 We tested the stove on a summer day and it took close to nine minutes to boil the water. the design above was able to boil it faster but it is much larger. Experimenting with air flow on the stove would likely improve the efficiency. 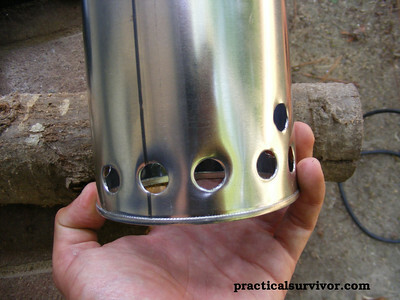 Larger holes and hole placement would likely lower the time it would take to boil the water. Well that's it, the water is boiling and I was hungry so....... I boiled an egg in 4 minutes and enjoyed breakfast. 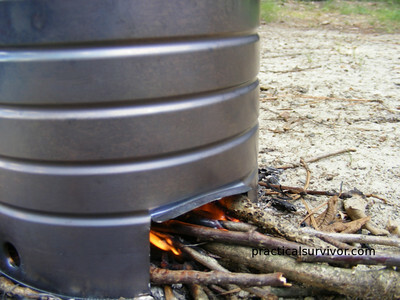 There are many hobo stove designs out there. Research and try different models to see what fits your particular need the best. Several readers wrote to us asking what stoves we recommend. 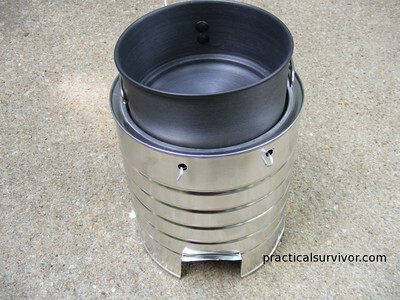 An excellent lightweight wood burning stove I enjoy using for backpacking is the Emberlit Stove. They have several lightweight models including Stainless Steel and Titanium models. There are times when burning wood is not an option (National Parks, fire ban during dry seasons). 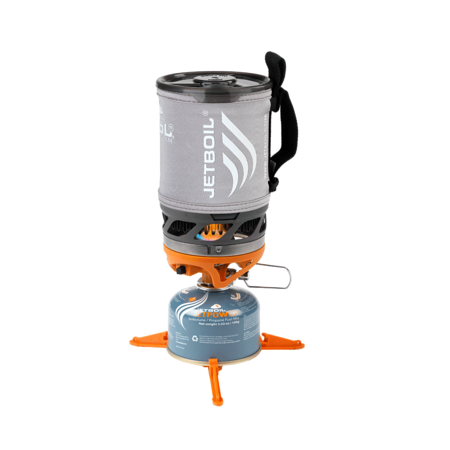 During those trips we use the Jet Boil Cooking System.